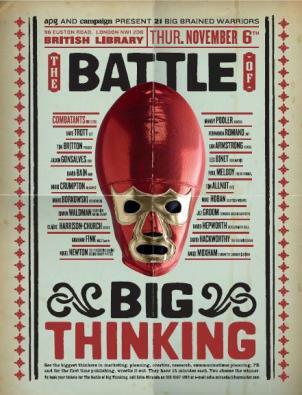 I got an email today reminding me about the forthcoming APG Battle of Big Thinking. It boasts an amazing line up of speakers and everyone I know who has been to a Big Thinking event before has raved about it. There’s just one problem – the cost. Its not a good time to be asking your boss to sign off a purchase order for £689 for a one day conference. Even the early bird rate of £559 for APG members looks steep in the current climate – especially when you cost in peak time return train tickets for us Outside London. Don’t get me wrong, my agency is doing OK at the moment, we’re just being sensible about splashing money about. If we’re going to be ruthlessly practical, what is of greater value to the agency – one day of Big Thinking for me or 125 sets of layout pads and marker pens?